This awesome expedition report I am able to read after the Belgian couple who traversed through Congo last year. This trip, organized by Indonesian Off-road federation, this little adventure is awesome because, it is the first time after 25 years someone in vehicles has decided to try to pass through a jungle where once in in 1985, all 15 Land Rovers trying to cross it were stuck and had to be air-lifted out of the jungle. Any expedition is very simple when describe in words so was is this one. 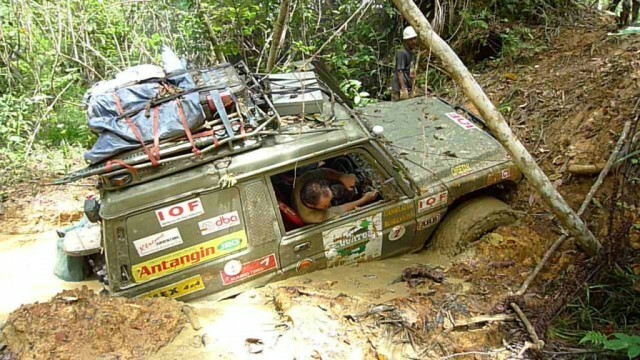 While sticking as much as close as they can to the equator, their expedition is the first to attempt an offroad crossing from the east coast to the west coast of Indonesian Kalimantan. Going through their thread was easy but it gave me a perspective of expeditions unbeknownst to me, its not just about dirt, its not just about the heat. It is an endurance race where the clock isn’t timing you but there are times when you wish you hadn’t come. One of the bikers was attacked by bees and to his luck, a nearby 4×4 off-roader was standing close to empty the bottle of baygon mosquito killer over him and his bike. People, this is the reason why 4×4 was created, you do not test the limits of 4×4, its basically you who are constantly tested as with a bike which can go almost everywhere, but it depends on your will to take it or not. PS: Websites, even Google, Flickr, etc are going on strike in protest to a legislation in US Senate and House called SOPA & PIPA which is going to change the internet as you know it. So check back again soon as they call off the strike.